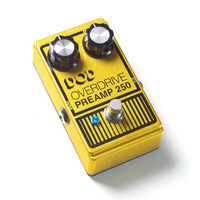 The DOD Overdrive Preamp 250 carries with it over 40 years of history and experience capturing all of the classic tone and wild heart of the original but with updated features. This entry was posted in Digitech and tagged Guitar-and-Bass. Bookmark the permalink.